Republican Senate candidate Patrick Morrisey is up two points over Democratic incumbent Sen. Joe Manchin (W.Va.), according to a new poll. A new poll shows Republican challenger Patrick Morrisey inching ahead of Democratic Sen. Joe Manchin in West Virginia’s pivotal Senate race. The poll, commissioned by the National Republican Senatorial Committee, shows Morrisey, the state attorney general, leading Manchin 44 percent to 42 percent. Libertarian Rusty Hollen takes 3 percent, and 12 percent are undecided. Take Hollen out of the equation, and Morrisey leads Manchin 47 percent to 45 percent, with 8 percent undecided. Morrisey said Monday during a campaign rally with Donald Trump, Jr. he was within the margin of error in his race to upset the Democratic incumbent Manchin. Fabrizio, Lee & Associates conducted the poll on behalf of the NRSC. Six hundred likely voters were surveyed between Oct. 16 and Oct. 18. Morrisey takes the lead in a poll that oversampled Democrats and women. Of those polled, 44 percent identified as Democrat, 38 percent as Republican, and 16 percent independent. Fifty-three percent of respondents were women. The Republican campaign distributed the poll to its campaign supporters. "West Virginians know that dishonest Washington liberal Joe Manchin stood with Hillary Clinton, and continues to side with the impeach, obstruct, and resist circus in Washington," said Morrisey for Senate spokesperson Nathan Brand. 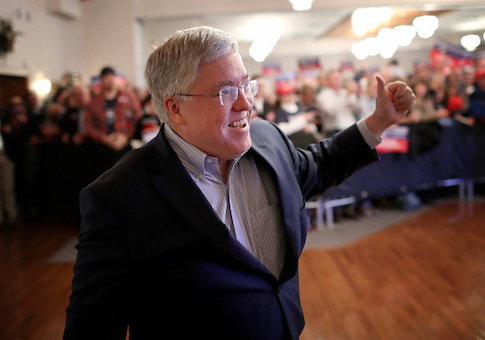 "Voters and President Trump trust only one candidate, Patrick Morrisey, to stand with West Virginians for the right to life, the Second Amendment, and the Make America Great Again agenda." This entry was posted in National Security and tagged 2018 Election, Joe Manchin, Patrick Morrisey. Bookmark the permalink.